‘If you’re an online seller, choose your platform wisely’, one might say after checking the results of the 35th semi-annual “Taking Stock with Teens” survey from Piper Jaffray. The retail giant has made the shopping experience way easier than anything else people were accustomed to and has backed that with highly efficient customer service. Teenagers have become more and more involved in online shopping as a result of the economic expansion experienced worldwide, and this is shown in numbers, as teen spending on Amazon has increased by 6% compared to last autumn and by 2% compared to last year. Also, it’s interesting to notice how teens spend more and more time shopping online, as the survey shows. In average, a teen spends up to 19% of their total shopping experience online, 2% percent more compared to last year. The survey also sheds more light on what the most sought after platforms and brands are by Gen Z, and Amazon wins by a large margin. A whopping 44% of the 8.000 teens that have participated in the survey have named Amazon as their main online shopping platform. 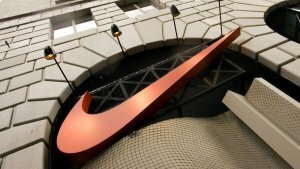 Nike is the second most popular online destination among teens, with a share of 8%. So the difference between Amazon and any other platform, including specific brand-related websites, is almost incredible. Way behind Amazon we can find American Eagle with 4%, and Urban Outfitters and Forever 21, both at 3%. An online seller who is looking to make a profit should always be aware of the type of buyers they expect for their merchandise and if the product they are selling is dedicated to youths. If that’s the case, Amazon should clearly be at the top of their list. 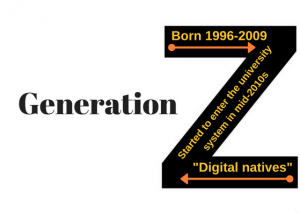 But what exactly are Generation Z teens buying online? The survey shows that food remains the favorite category in which teens spend their money. Teens from households with an average annual income of $100,000 spent approximately 24% of their funds on food or food-related products. Clothing follows food as the second most popular online shopping category among teens, with athletic and casual streetwear brands at the forefront. The top clothing brands for Gen Z teens are Nike, with 23%, American Eagle, with 10%, Adidas, with 6%, Forever 21 and Urban Outfitters, both with 4% each. 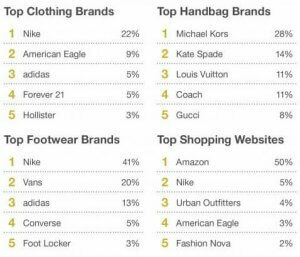 Nike is also the most important footwear brand, with 42%, followed by Vans, with 16%, Adidas, with 14% and Converse, with 4%. Beauty products among girls are what video games are for boys, the third most popular shopping category, but this time determined by gender. Do you have a complex online business that also needs to integrate with Amazon? See how we can help you increase sales on Amazon starting from Today! Ad-Lister is the multi-platform listing tool that can easily be tailored to suit your needs. It comes built-in with a lot of features that will help you improve your business’ workflow and increase your sales. By using Ad-Lister for your online sales, you can import your products from eBay or just create new ones using our interface and then list them onto Amazon, or on any of the major e-commerce platforms such as Magento, WooCommerce, BigCommerce, Shopify and many others. Do you want to start selling online to a targeted audience? No questions asked, the “Taking Stock with Teens” survey results will surely be of interest for you or any other online sellers, with this type of insight being used for customer targeting. 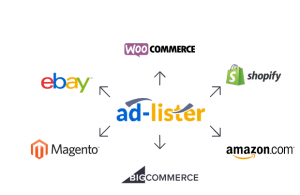 Ad-Lister can help you increase sales on Amazon, Shopify, Magento or any other e-commerce platform by letting you post products available on one platform to the others. This can help you rapidly increase the volume of products you have on your platforms, ultimately increasing the sales you have on them. If, for example, business owners want to become relevant for teens and thus looking for the perfect selling platform that speaks to them, they will most certainly find Amazon as the best marketplace for their selected audience.